On the night of the Boston University women’s soccer game against Harvard University Wednesday, the team collaborated with the BU American Sign Language community to host Deaf Night, inviting the community to a night of free food, school spirit and competitive soccer. The BU Deaf studies department collaborated with BU Athletics for the first time in February, said Deaf studies professor Bruce Bucci via an interpreter. Working in tandem with the women’s basketball team, the Deaf community put together the American Sign Language Night. 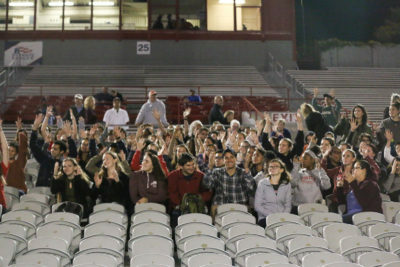 This semester, women’s soccer head coach Nancy Feldman and her team followed suit, organizing for free admission to the Wednesday game for Deaf studies students and faculty, as well as class credit for ASL students. Several of the students within BU athletics are already proficient in ASL, she said. Although students can now earn a Bachelor’s degree or minor in Deaf studies at BU, much of the current collaboration and activity taking place was inaccessible several years ago. Bucci expressed his determination back in 2012 in an interview with The Daily Free Press to make BU’s Deaf studies programs and community well-known. “My vision for [the] BU Deaf studies program is to increase awareness about deaf studies and deaf people in general” Bucci said in the 2012 interview, explaining that he wanted to make the university’s deaf studies program available to primary and secondary schools throughout Massachusetts. But Bucci was also heavily involved in setting up Deaf Night this fall. 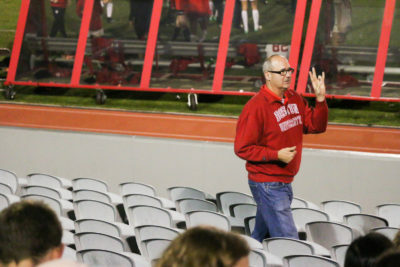 He said many of the women’s soccer players knew some level of ASL. Bucci did note some of the unique challenges that could occur if a student athlete is deaf. He added that communication aspect is the most difficult challenge since they could struggle to communicate with their teammates and their coaches if there is not an interpreter present or if the rest of the team does not know sign language. But, he said, this challenge doesn’t apply to every deaf athlete, as some have the ability to communicate without using sign language. Beyond Deaf Night, Bucci mentioned the variety of services the ASL community offers Deaf students at the university. Bucci’s initiative through on-campus events and off-campus advertisement has garnered a lot attention and applause from professionals throughout BU. “Bruce Bucci, an ASL professor, has been honored before and he will be honored [this time too],” Feldman said. In spite of efforts to increase awareness about the deaf community, there still exists a veritable distance between the Deaf and hearing communities, Bucci said. The BU Deaf studies and ASL society at BU seeks to reshape the environment by normalizing deafness and its associated culture. Breanne Kovatch and Matthew Martin contributed to the reporting on this article.